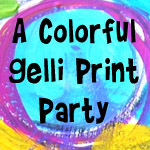 I will begin by adding some printables that I made last week, before I got sidetracked by bookmaking. I think looking at the PDF on my monitor, the text looks fuzzy. I’ve printed them to test for myself and they are actually fine. 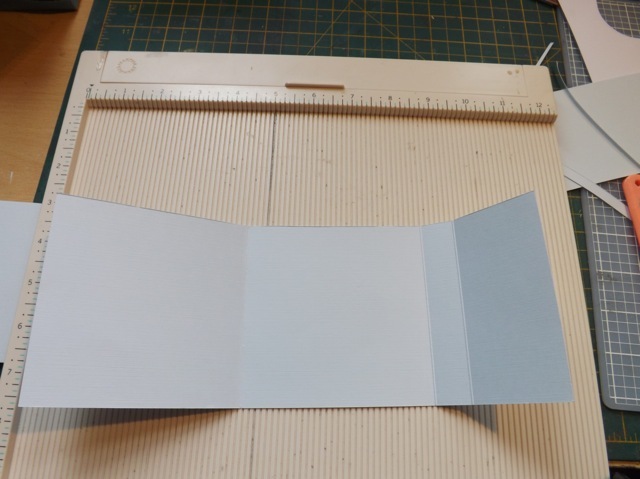 There are strips for a 6×4 photo (along the 6″ or 4″ edge) and the 4″ inch ones also fit a 3×4 inch photo or filler card. There are some 3″ ones too. 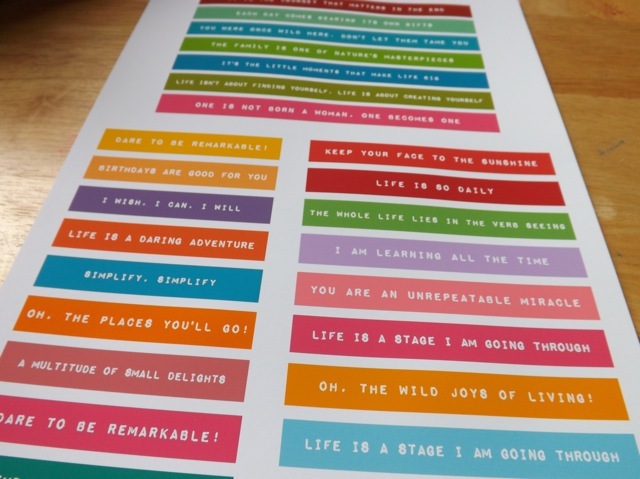 Just little label-maker style text strips that you might find useful. Grab them here. 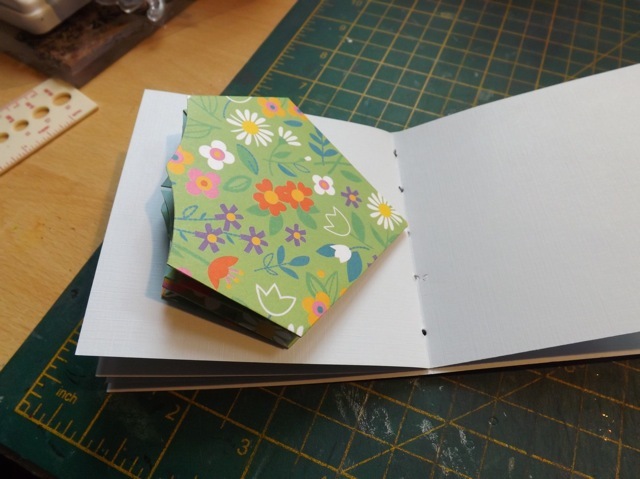 Now continuing the bookmaking adventure, I did try the rectangular labels. Not a total fail but not a total success either. First, an annoyance. 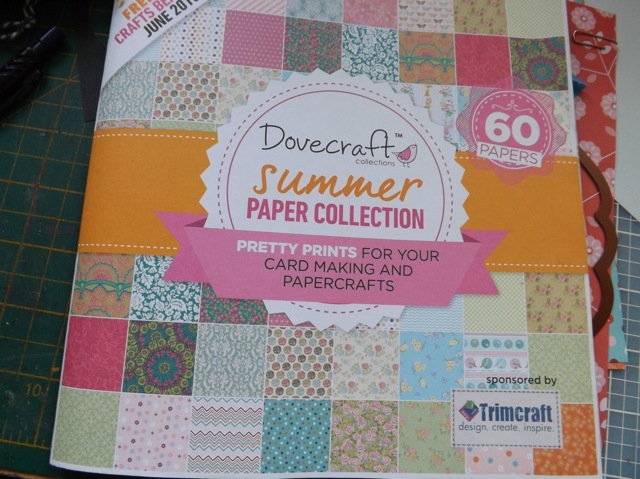 I was quite pleased with the paper booklet that came as a gift with Crafts Beautiful. 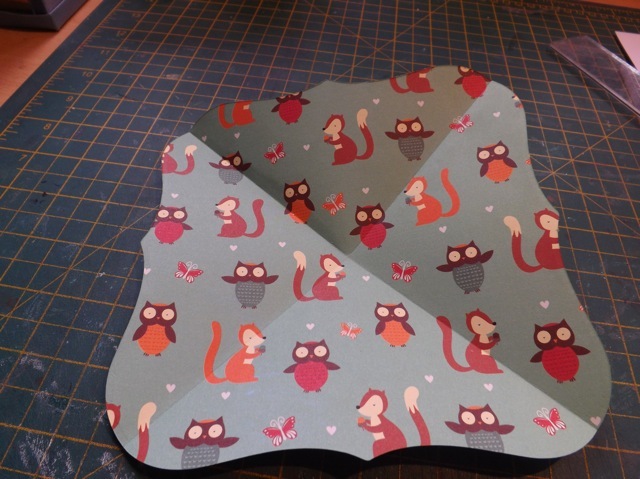 Cute patterns, mostly, double-sided and a nice weight for the map folds, not too bulky. Then I opened it. WTF? Some of the edges look a little nibbled. 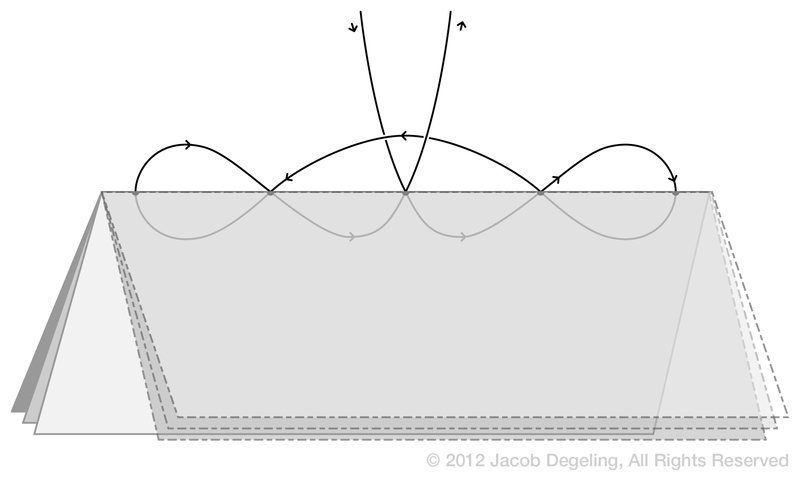 The real problem is that there is a formula for doing the map fold on a rectangle. 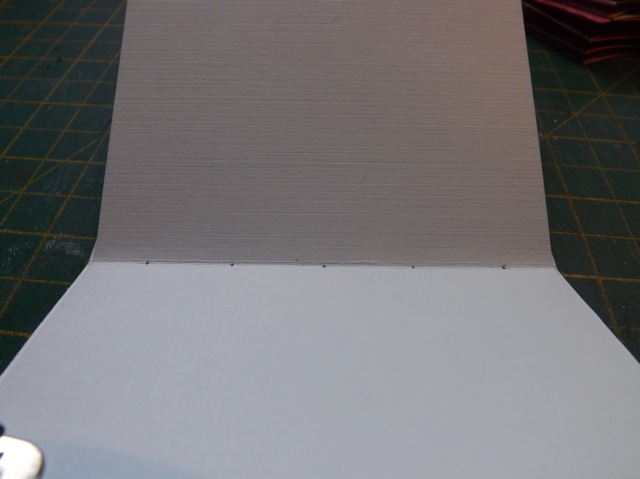 Width – Height / 2 (width of paper across minus the height of the paper divided by 2) and that number is where you would mark for your diagonal score lines. 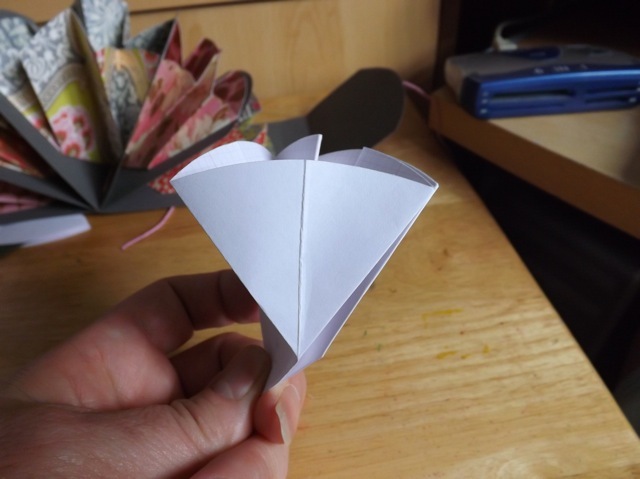 But because of the shaped edges I was struggling to get it right. Technically that is 9 1/2 wide minus 6 high = 3 1/2 divided by 2 = 1 3/4 inches. 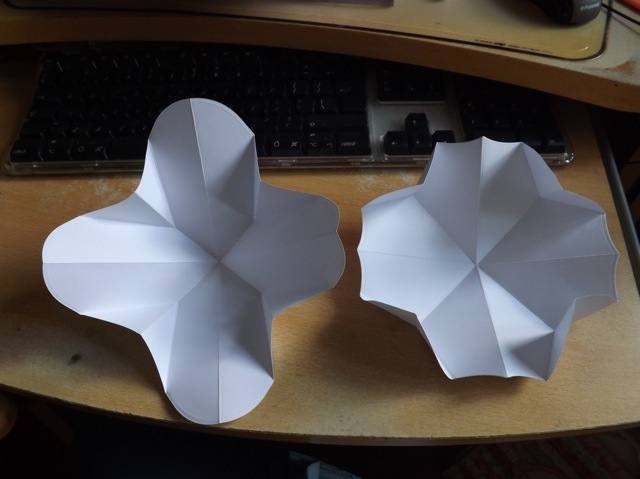 But every time I did it, it seemed to fold just slightly differently. 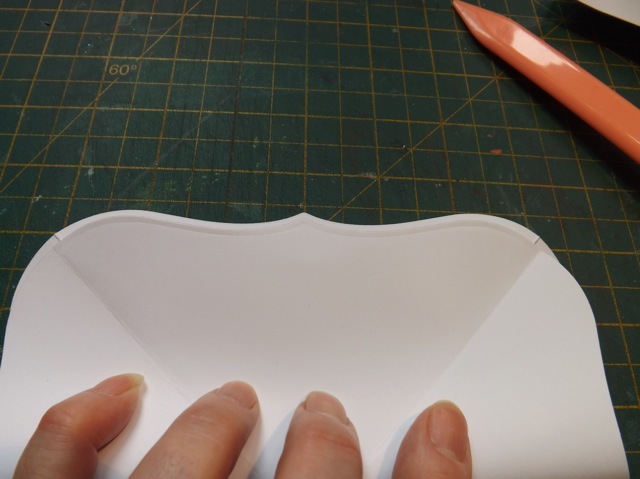 And sometimes the folds had to be adjusted so the finished unit had neat edges. 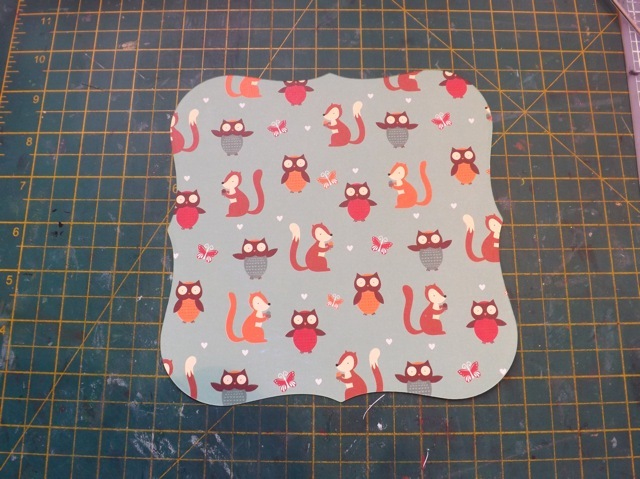 I found doing one side perfectly then adjusting the other so the points matched, worked best. 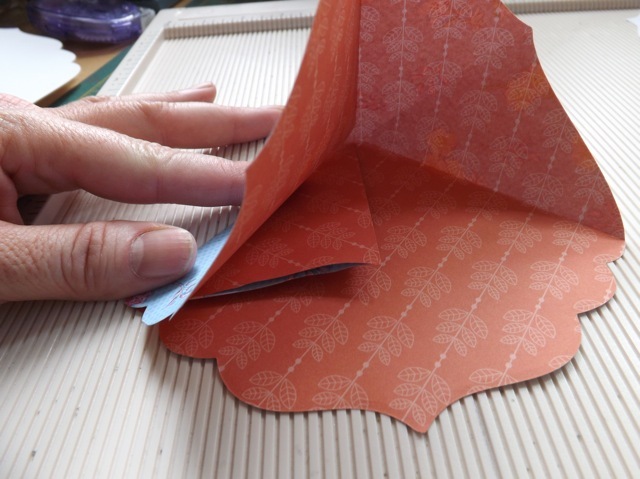 And making a template for the point to fold the side in to helped as well. 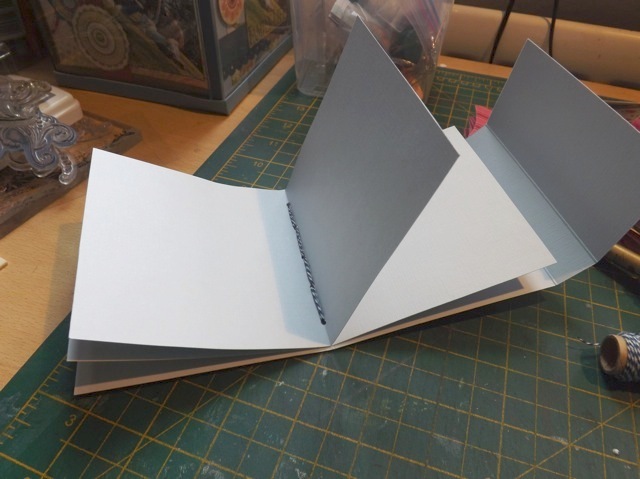 The construction is pretty much the same, although I made the covers from the biggest size (same as the pages) then the inner cardstock dividers from the next size down. It made for an interesting book. 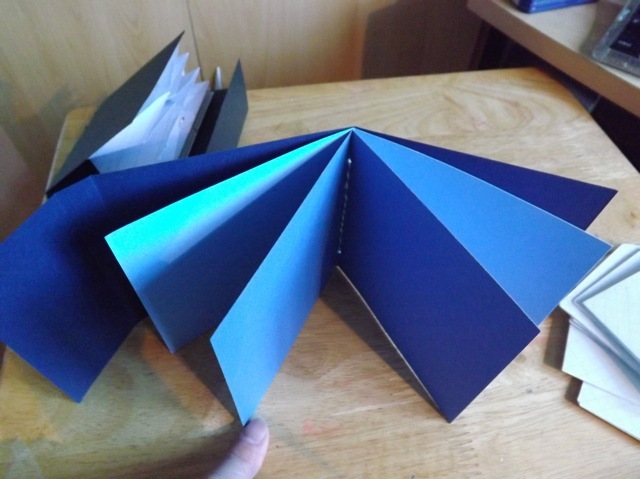 Go back to the previous posts here and here for more detail on the map-fold books. 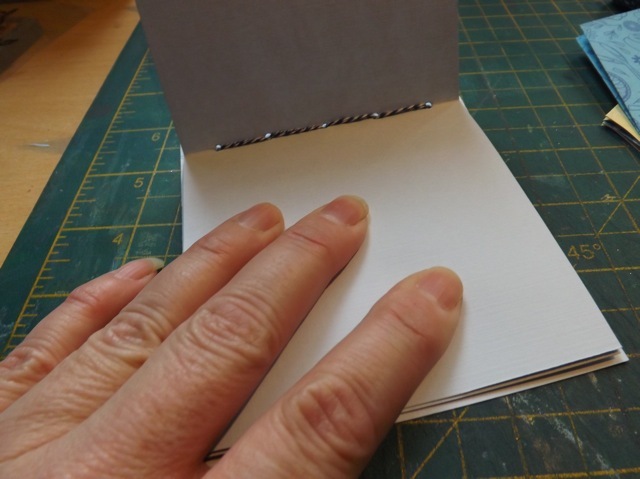 This post talks about folding directional papers. 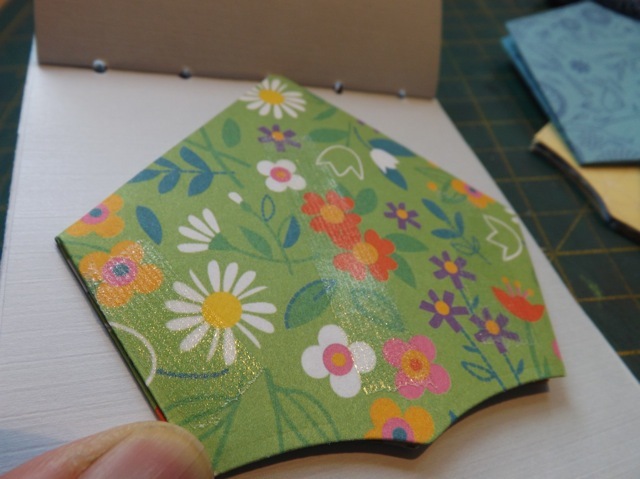 I am madly folding pop-up boxes, from my better designed .svg, to finish off the handful of ATCs before Wednesday. Bank holiday tomorrow and we may actually get out for the day, so doing laundry too. Blech. After spending the entire day disassembling DS’s Stompa bed OMG! what a job) and filing a mountain of paperwork, and prepping an enormous amount of meat for the BBQ (enough to last the week for sure) and to populate the new freezer, I could use a day out…. 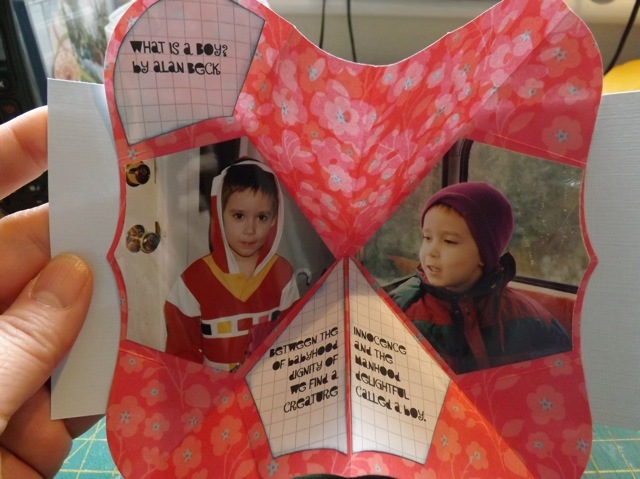 Categories: handmade books, map fold pdf, mini-albums, printables, Project Life, tutorial | Tags: handmade books, mini-albums, printables, Project Life | Permalink. 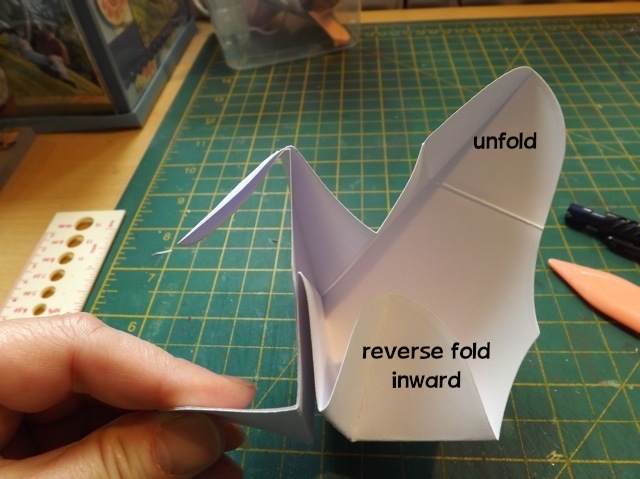 I’ve already explained the map fold, so this is more to save yo ruining a piece of paper yo want to use by making a wrong fold. 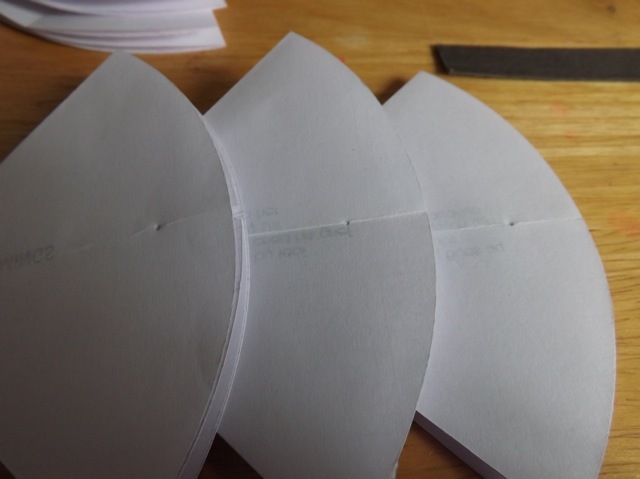 Firstly, look at how hugely different the labels die cut can be folded. I suppose you could make a case for both versions being useful, but the one on the right (in the bottom photo, left in the top one) is the one that offers the most useable space, I think. That is the one I will explain. 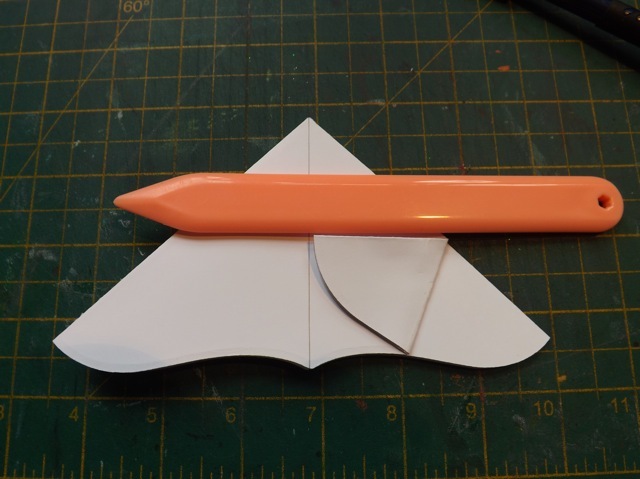 You can make the other version by just switching the bump and point folds. 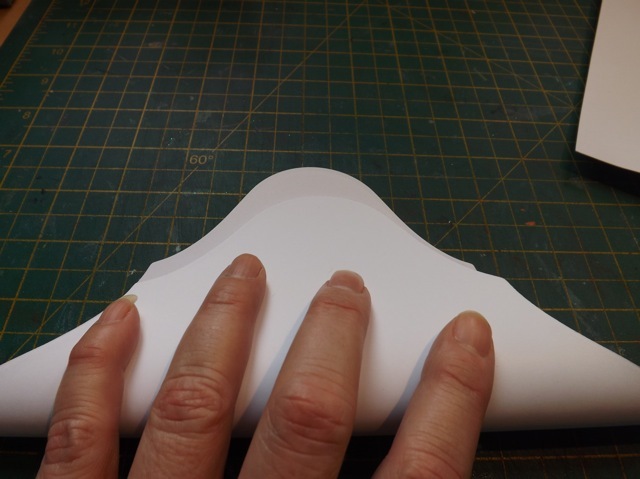 I trust you can identify a bump and a point…. 1. 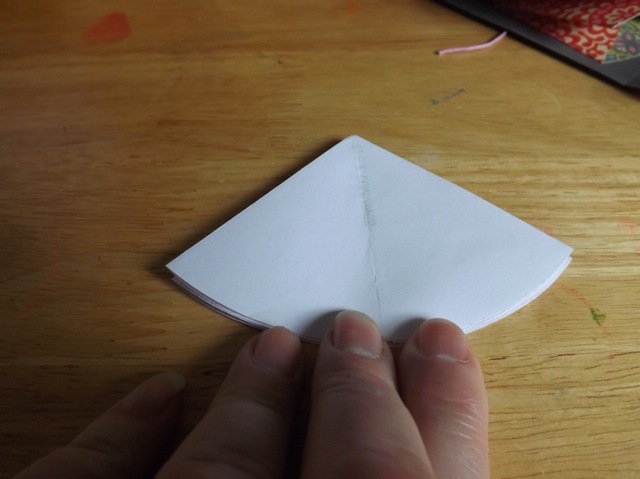 Begin by folding the piece in half, two bumps together. 2. 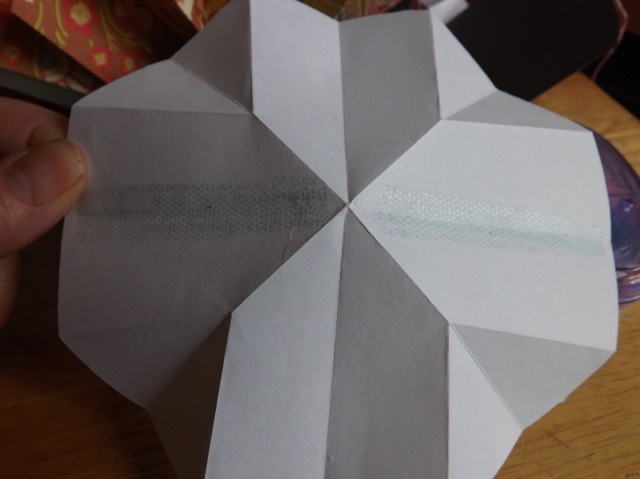 With the mountain fold on the inside, fold in half, matching the points. 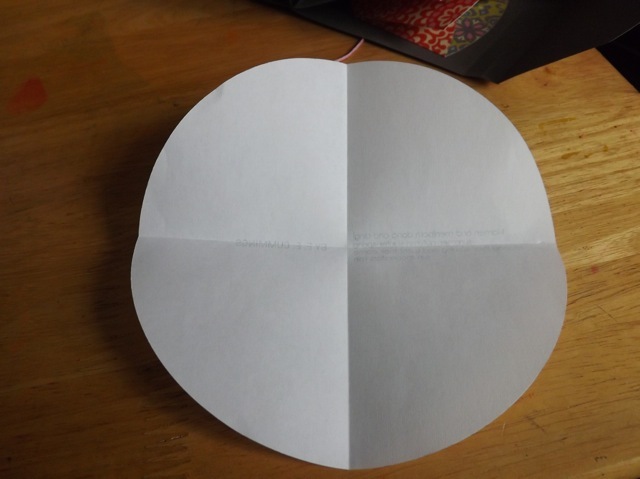 and fold the reverse side to match. 4. 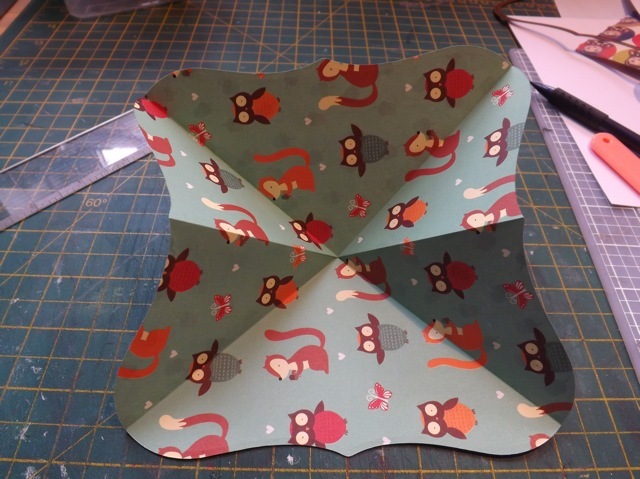 This is the tricky reverse-the-fold bit. 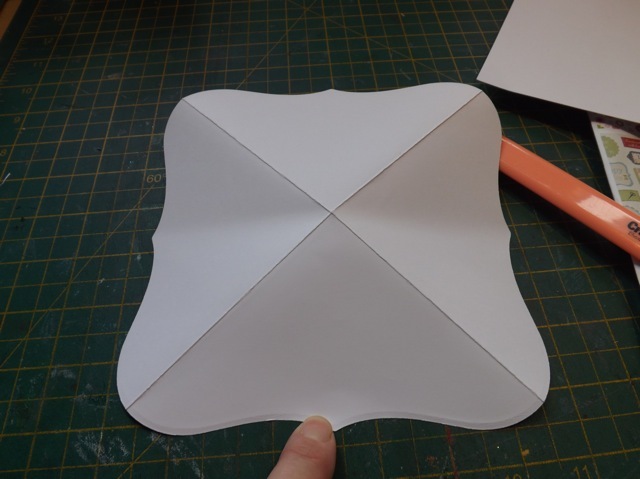 Unfold each fold, and reverse the centre fold so the bump is inside. 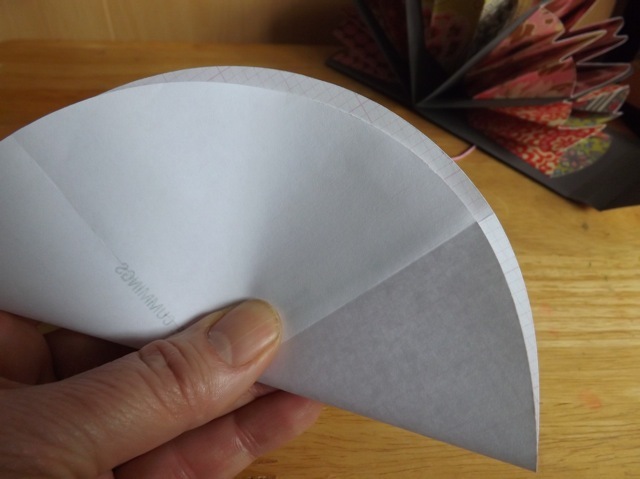 The trick with paper that has an actual directions, that needs to be seen right side up, is to orient the paper correctly to begin with. 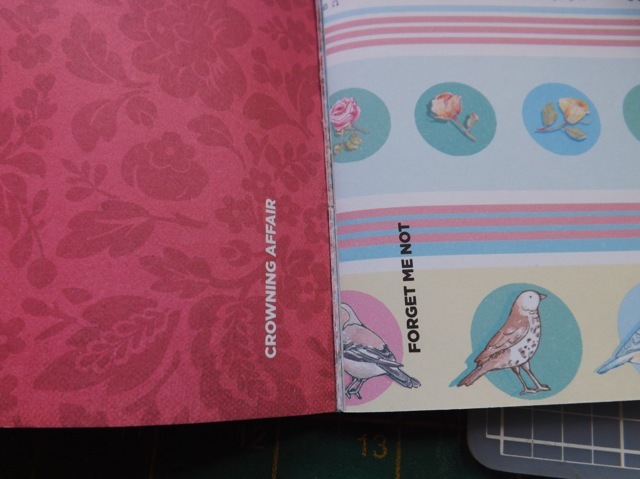 It only looks wrong – the flat (unscored) areas are the “pages” where the unit is stuck inside the book base. 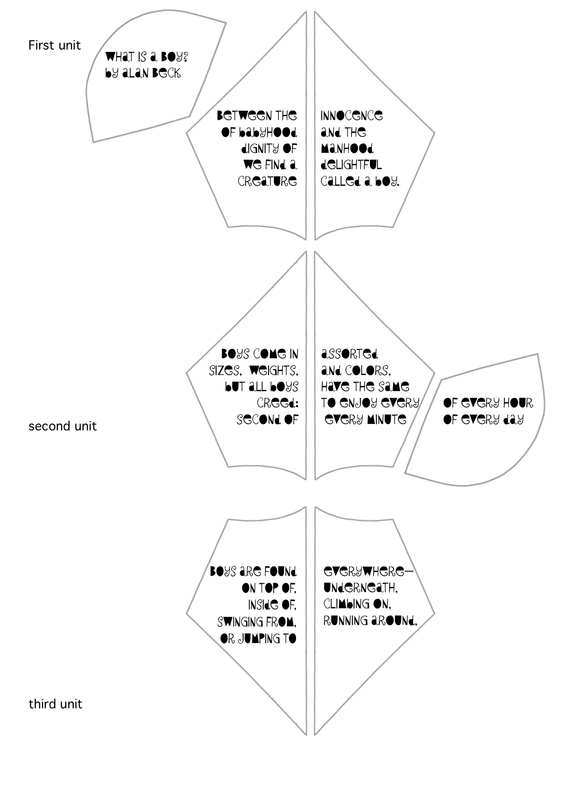 I am going to add the PDF of the shaped areas, without the poem, as it is more useful and no one really expressed any interest in having the with-text version. 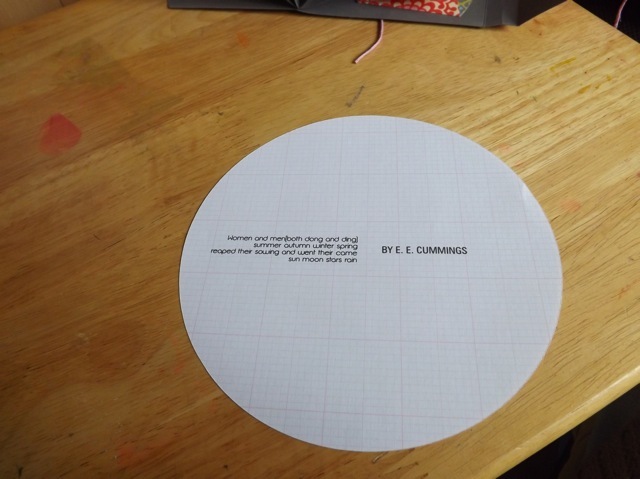 You can easily create the sized text blocks and print them then stick the cut out bits over the test and print again. Have fun! You know, I have a set of rectangular brackets as well – I wonder…. 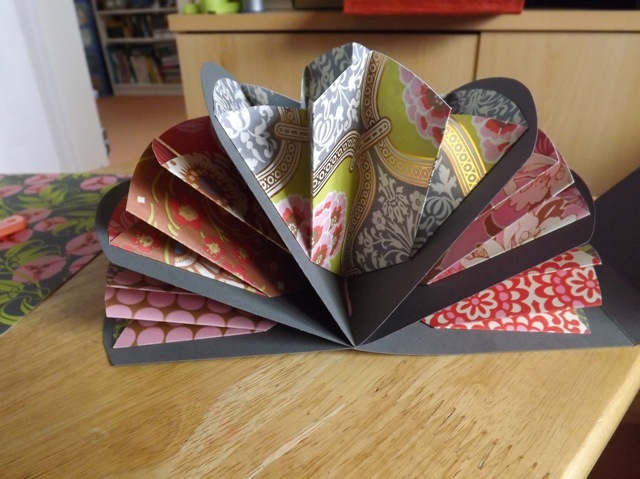 So the bookmaking group I am on (pretty darn nearly the only thing that ever drives me to log in to Facebook) had a challenge for a Turkish Map Fold book. 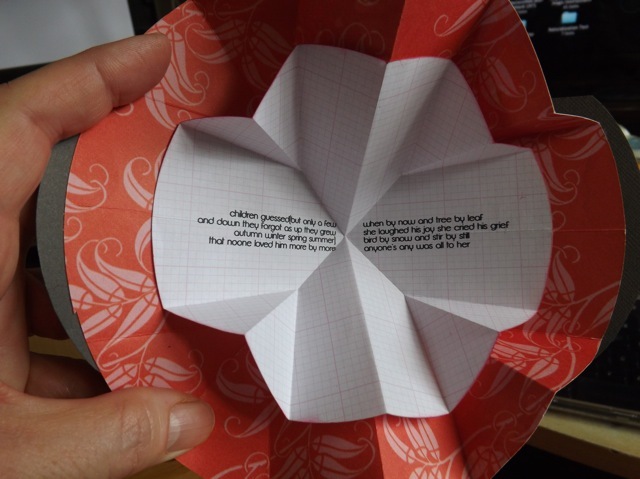 You may recall I reposted quite an old PDF of instructions that had disappeared from the net. 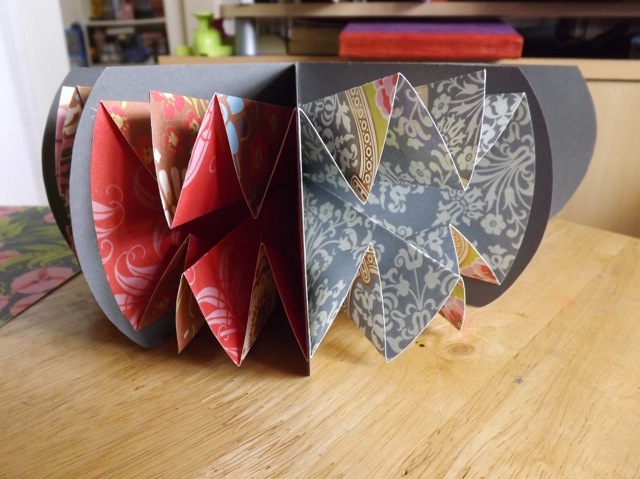 I’ve always like this fold, and had a bit of a play with it. 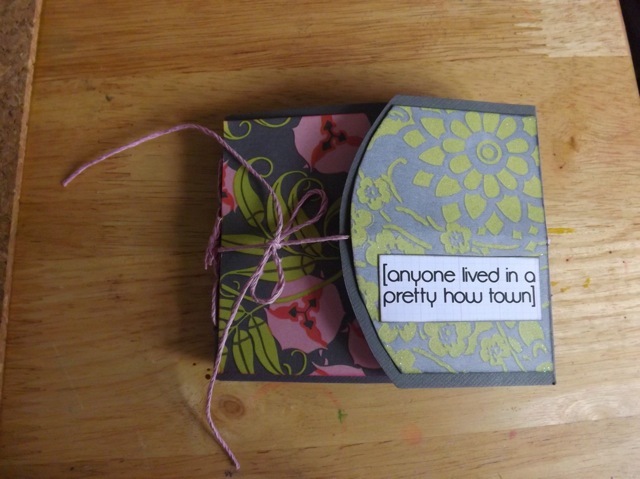 The book was cute enough, but I had to make another one so I could improve the construction. 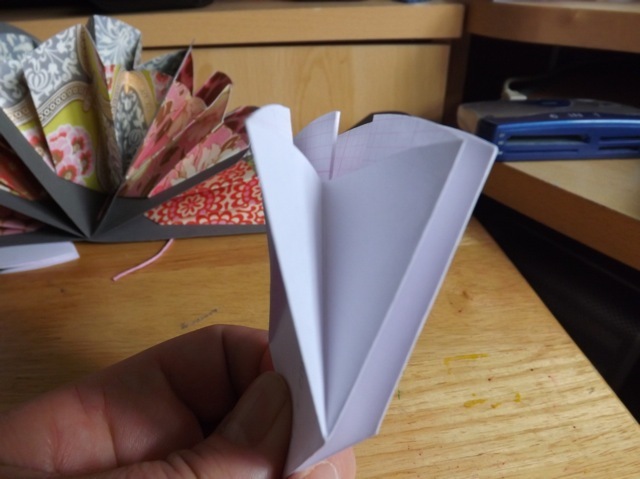 As this is going to be VERY photo intense I’ll just show you the bare bones – a three-folds pamphlet with a flap. The Turkish map folds are stuck two together and then stuck between each section. 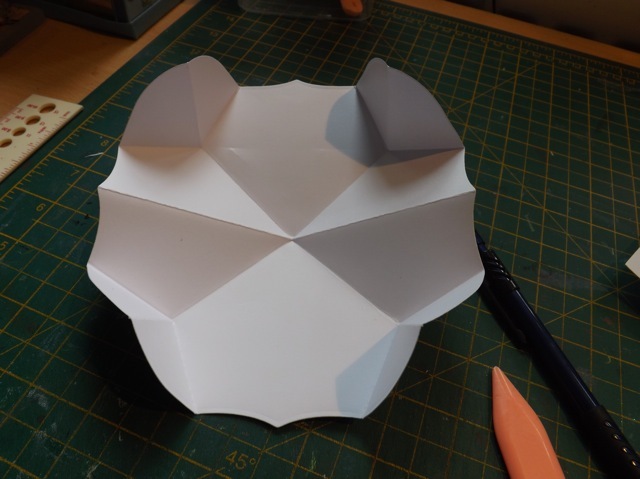 I’ll do another post about the construction but today I want to explain the HUNGARIAN map fold, a variation on this one, and my circular variation on that. 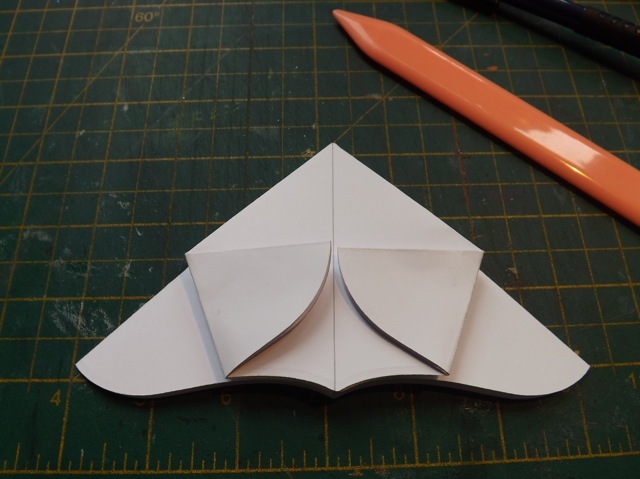 There is a great post here with the basic fold. That is for a square piece. 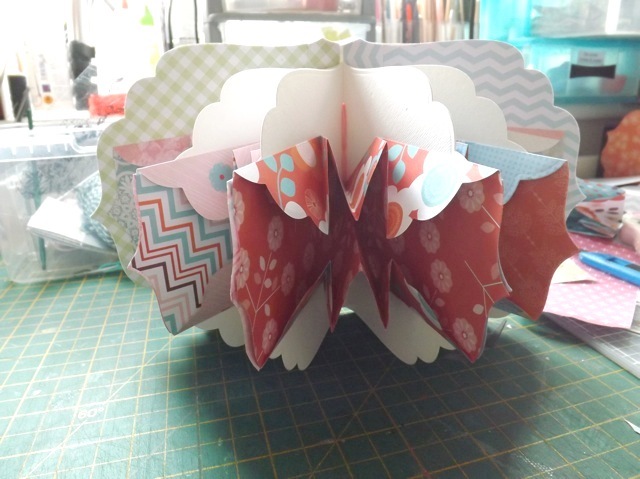 And don’t be fooled by the video that may pop up – it’s for the Turkish fold, not the Hungarian one. Although to be fair it is only one additional diagonal that differentiates the two, and by sticking the units so one piece is flat, mine really ends up being more Turkish than Hungarian LOL! But orienting the text is easier with the additional diagonal, I think. 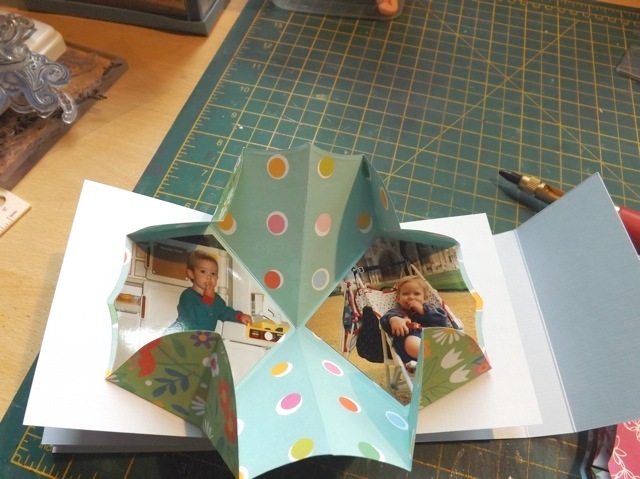 Let me show you the finished book first. I would say e.e. cummings is my favourite poet and this one of my favourite poems. This is what the it looks like opened. 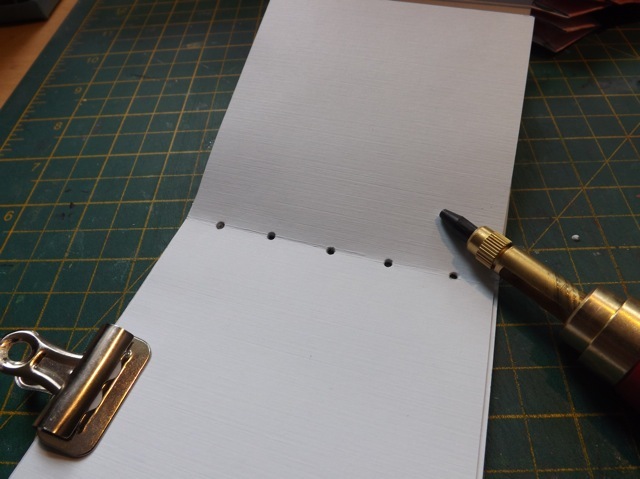 but without the inserts. 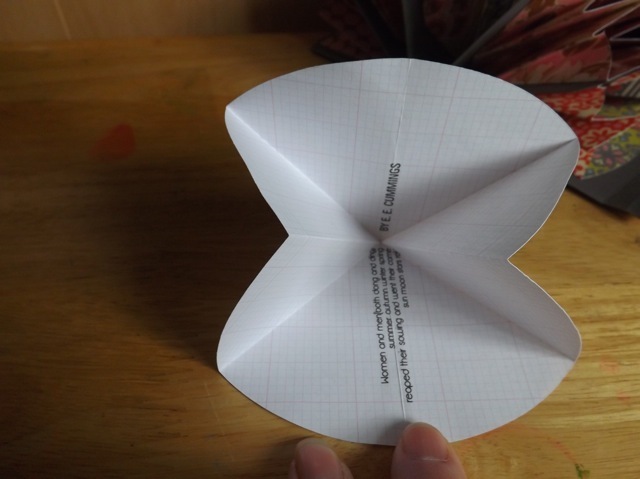 Unlike the Turkish one from yesterday, this one has only ONE insert between each section. 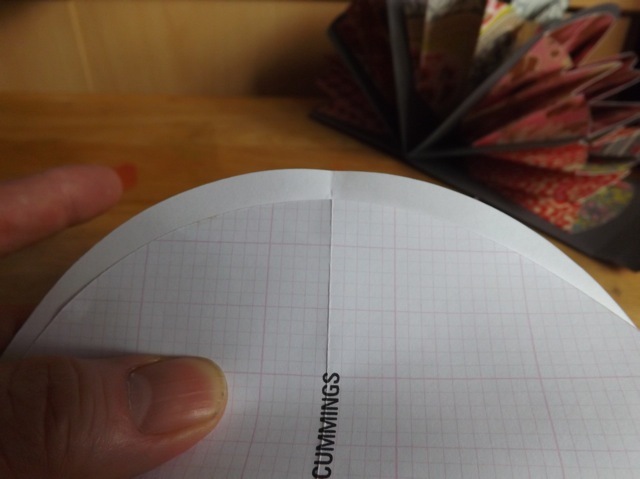 The inserts are heavier weight than the graph paper so two would have made the book VERY thick. 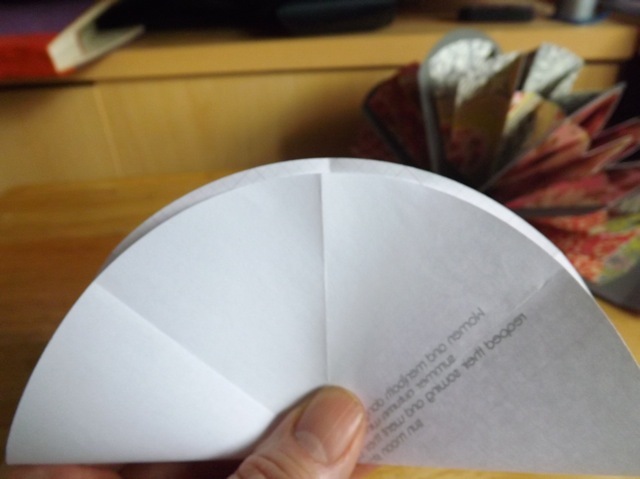 I’ll be showing you folding specifically for the placement of the text as well as folding a “diagonal” on a circle the only thing you need to know that the original linked page doesn’t cover. 1. I printed the text across the middle of pink graph paper. 2. 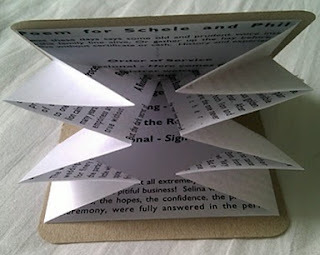 Open and fold, again with the text on the outside, in half side to side. 3. 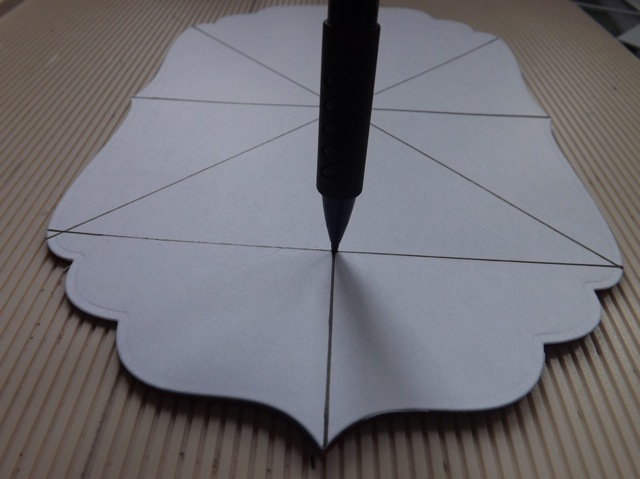 Fold the diagonals by matching the fold lines. 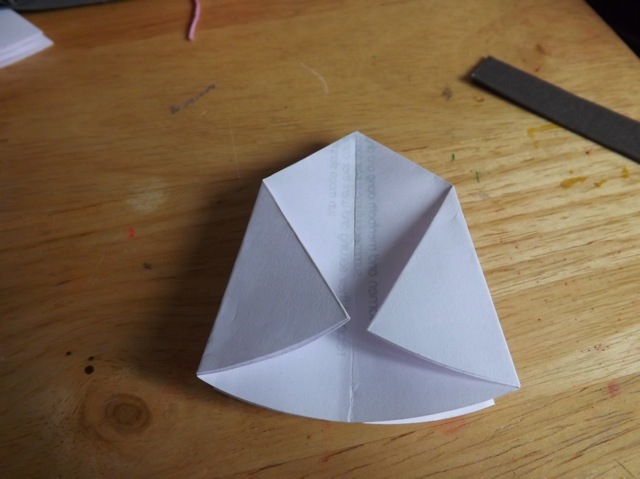 This is the only tricky fold. 5. Collapse the piece. 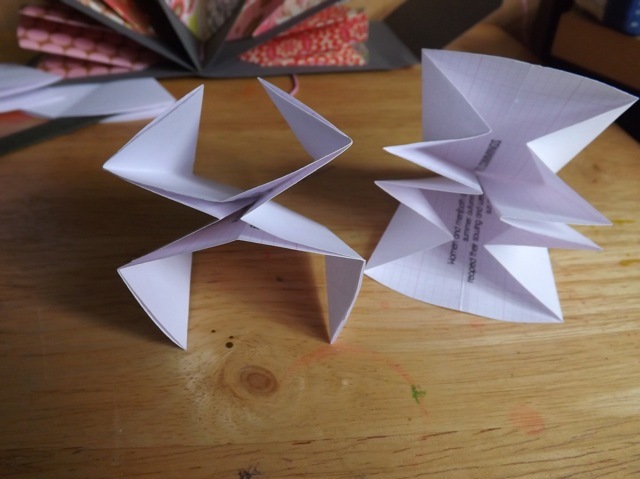 It should want to collapse, if you’ve done the folds right. 6. Mark each unit at the same point – can you see the tiny dots? 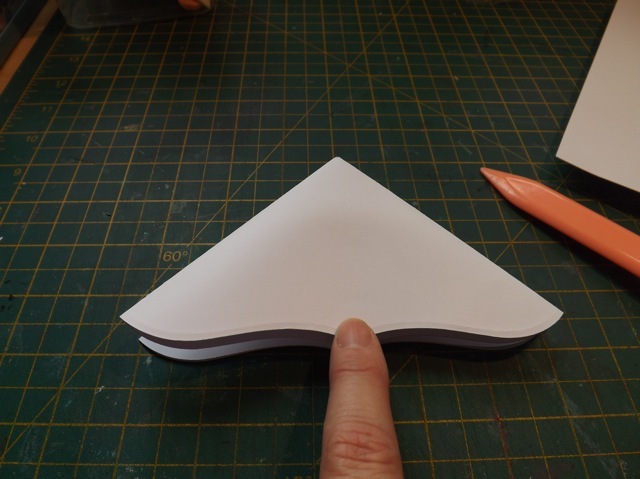 then fold in the side to meet the point. 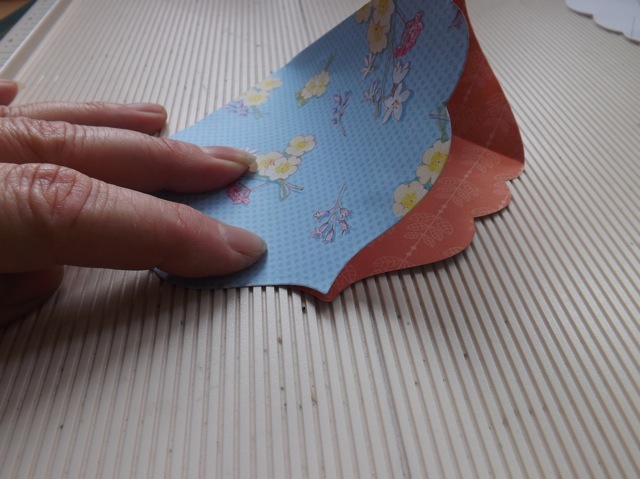 Re-crease the folds. It will change from the left image to the right one. and yet they collapse fine. I experimented with a number of circle sizes and they all seem to nest nicely. It would make a nice card too, just one fold. 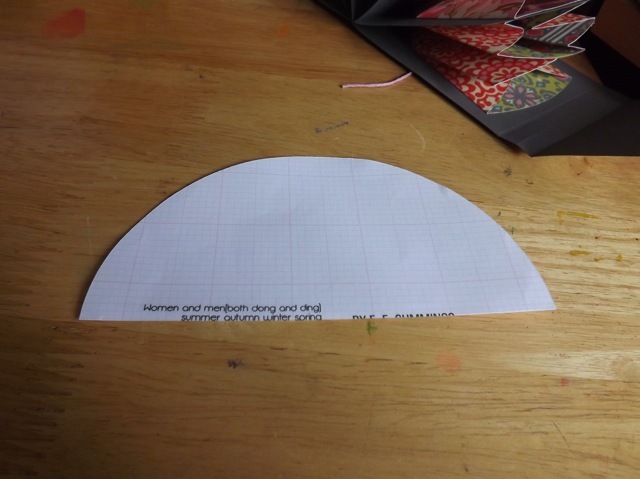 And I can do the straight Turkish fold on a circle and see if it really is the same (minus the extra diagonal) and if it matters. Jeez. 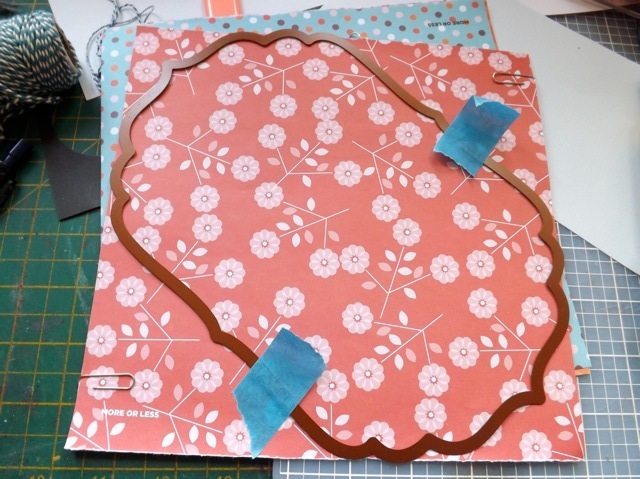 I am so out of practice for these tutorial sorts of posts. I’ll try to be more concise for the next one, just need to get my groove back. 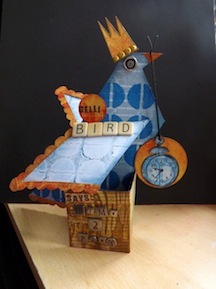 And finish those last few ATCs before Wednesday! 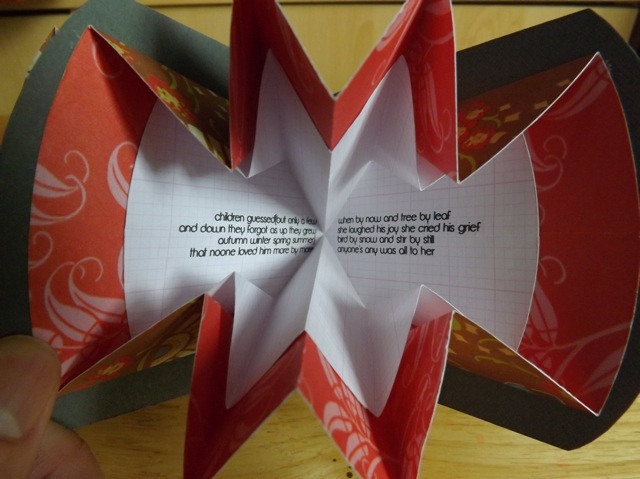 Categories: cards, map fold pdf, mini-albums, paper sculptures, tutorial | Tags: big cards, how-to, mini-albums | Permalink. 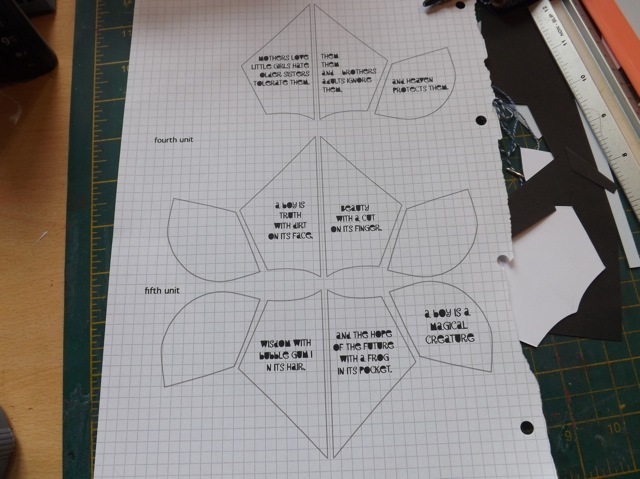 This came up on UKScrappers, and the member looking for it mentioned that “the best” instructions” were linked to a site to download the PDF that no longer existed. I was able to search for it using the WayBack Machine (which I think I’ve mentioned before – it takes snapshots of internet sites and keeps them available even when the site disappears) and was lucky enough to find the PDF still available for download! I added the link on UKS, but it occurred to me that people might search for it, find the UKS link, then not be able to download it as only members can see the links and download them. So rather than have a whole host of people joining UKS just to be able to download the link, but never intending to actually become part of the community, I thought it would make more sense to repost it here. The note in the file indicates so long as the info file is included it can be shared freely so that is what I am doing. So if you are searching for this link, it is dead and gone, do NOT click on it! Click here instead to download the PDF. 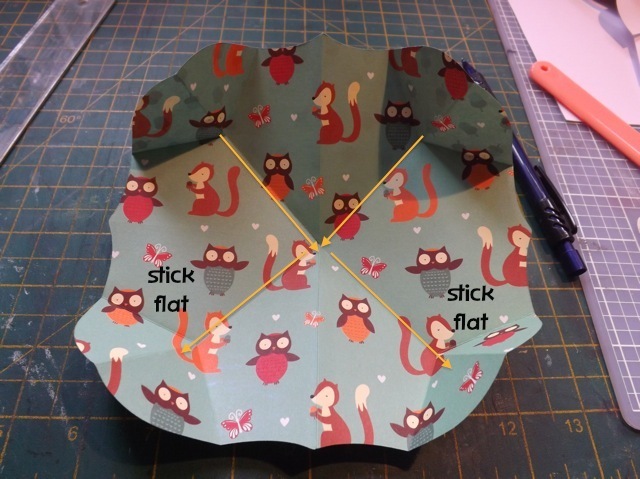 Just adding this link as well – I like the little animation at the top ! 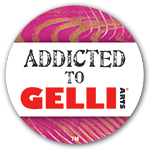 Here is an image so you know what it’s all about! If you click the image you will go to the site the image came from. Sorry to my WOYWW visitors if this one shows up first but, hey, you may appreciate the download as well! 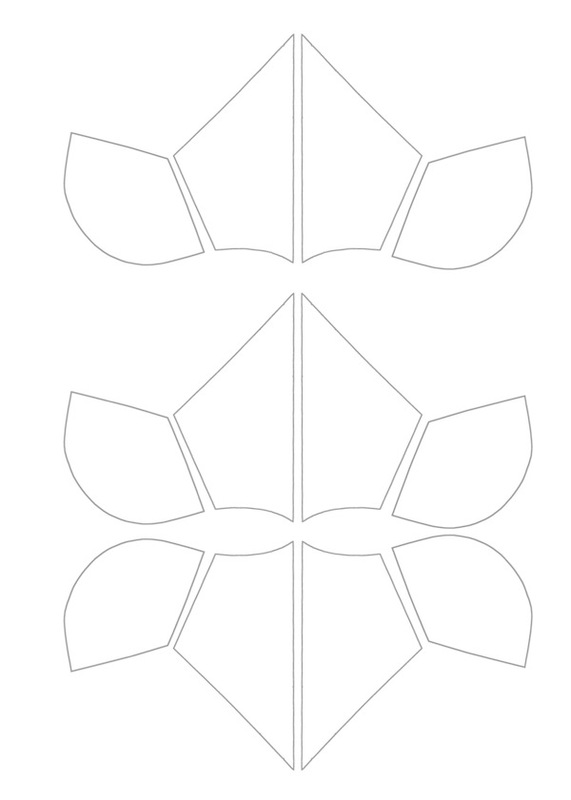 Categories: map fold pdf | Tags: paper folding | Permalink.